My daughter just needs to sign 2 dozen of these heart cards and they're ready to go! 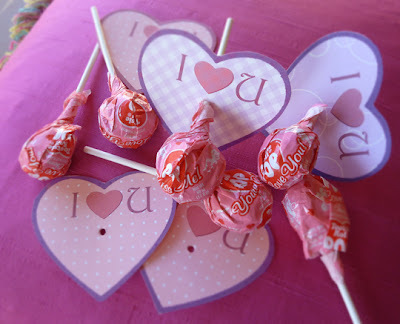 I made simple heart collars for pink Valentine Tootsie Pops. I printed a thick heart outline and "I heart U" onto assorted patterned papers. The thick outline so she can help me with the cutting! We punched holes in the center and that's about all I have time for this year! I couldn't even think of a clever pun for suckers. Oh well. :-) Happy Valentine's Day to you all!! That´s a lovely idea! Our children are not allowed to bring sweets (because of sugar: teeth problems, obesive kids, etc.). But the idea is good. I will remember it and change the sweets for fruit or a pencil.